We all became photographers the moment we got our first smartphone. From our food to our cats to ourselves, we now photograph everything and anything, and share these images with world via social text message, Facebook, or the huge number of photo-sharing apps which enjoy so much popularity on the App store and Google Play. Given the role photo apps play in our lives, we at Startup Digest, thought it was about time we covered 5 startups changing the way we take, share, and look at pictures. We’re going to start today with an app that combines the best of photo editing tools with a platform for sharing and possibly even selling your work. EyeEm is basically THE app for you if you are an aspiring photographer. The app lets its users edit their photos with 24 free filters, and a bevy of tools like exposure correction, leveling, and cropping-it’s like having a more user-friendly version of PhotoShop on your phone. Don’t let the filters fool you though. EyeEm is way more than a more pretentious version of Instagram. It’s also a community that helps you connect with friends and other photographers. You can check out photo albums from some of the apps myriad artists from anywhere in the world. Competitive photographers can enter one of the EyeEm-hosted photo contests sponsored by corporate partners like Lufthansa and Airbnb. If your work is good enough, you can sell it through EyeEm’s photo market. The idea with this is to connect brands with images they can use in advertising. The benefit for the photographer is that they retain all copyright and ownership of the images, and they will get paid royalties for their use. EyeEm got its start in Berlin in 2011, and received an initial $6 million in funding from Wellington Partners and Passion Capital, according to Tech Crunch. Since then, EyeEm has gone on to pick up an additional $12 million in funding. You can download EyeEm for Android, iOS, and Windows Phone. This is the sensible alternative to the selfie-stick that the world has been waiting for. 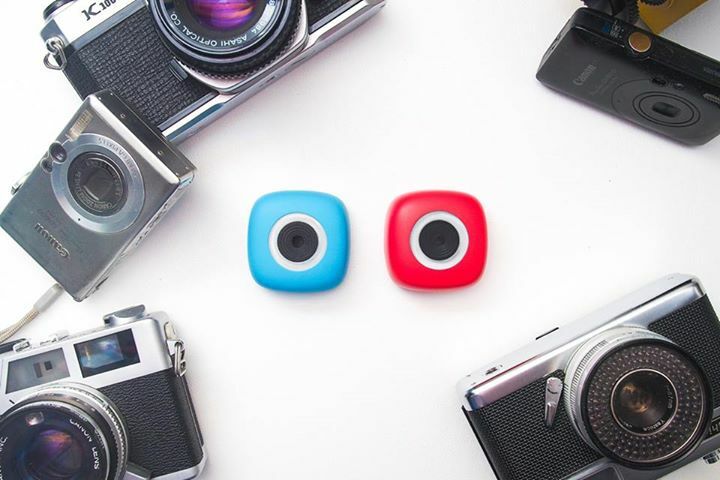 Podo Labs has created a small, app-controlled, re-stickable camera that can attach to any surface-glass, cement, wood, brick, anything! Technologically speaking, the hardware is impressive. Podo’s remote camera boasts an 8MP image sensor, Bluetooth, a re-chargeable Li-ion battery, 4GB of memory, a USB port, an accelerometer, LEDS, and the proprietary “micro-suction” cups which make it so “stickable”-if Spiderman were a camera, he would be this one. Users of the device control it through the Podo app for Android and iOS, which communicates with its remote camera counterpart via Bluetooth. You can use the app to get previews of what your pictures will look like, and set timers for taking group or action shots. The pictures you take with Podo are automatically saved to the app’s gallery, where they can be shared with friends. What makes this device so brilliant is its versatility. You can mount it to your hat and capture pics from a bike-ride, or attach it to the wall at concert-you can find more suggestions for sweet photo ops on the company’s site. As is the case with most hardware startups, Podo’s monetization strategy is pretty straightforward: sell as many $99 re-stickable cameras as possible. The Podo Labs founders, Jae Choi and Sam Pullman, have so far pulled in over $2 million in funding from venture capital firms like Kima Ventures and PCH international. Kicksend is all about building beautiful apps that let users do more with their smartphone pictures. Their first product, the eponymous Kicksend app, lets users share photos with others or have them printed and shipped to themselves or loved ones. Yes, millennials, you can actually print pictures. Since the Kicksend app really does two separate but equally important things, help share pictures and facilitate printing them, let’s break it down into parts. The “sharing” part of the app lets users transfer unlimited photos to friends and family in bulk, which means no more having to send images one-by-one. Once the images are sent, they can be commented on by the recipient, effectively turning your pictures into a conversation piece. Your mom will love it! The “printing” part of the app is even more amazing. Kicksend users can opt to have their smartphone pictures printed and sent to others in over 11 countries worldwide. How do they do it? Through strategic partnerships with business like CVS, Walgreens, Duane Read, and Target which offer 1-hour photo printing services. The price of printing and sending pictures varies depending on the number and size of the photos you want to send; Kicksend does offer a deal in which users can get free shipping if they buy 10 or more prints. But price is nothing compared to the smile on your grandma’s face when she gets an envelope full of pictures from you. Kicksend’s founding team, Pradeep Elankumaran and Brendan Lim, were part of YCombinator’s class of spring 2011. To date they have received over $2.5 million in investments from firms like SV Angel, True Ventures, and DG Incubation. The Kicksend app is available for Android, iOS, and Windows Phone. SimplePrints is another great startup bringing the digital photo back to reality. The challenge, to paraphrase the company’s founders Matt Sullivan and Alex Oliveira, is to turn the barrage of professional quality pictures we have stored on our phones or in the cloud into meaningful stories. Their solution? Help users turn their smartphone pictures into a gorgeous, professional quality photo album printed on artisanal paper in California. Considering the craftsmanship that goes into building a physical album, Simpleprints makes the process seem almost too simple. Users start by selecting smartphone pictures and stitching them together with the help of frames provided by the app; you can add captions to these pictures as well. The next step is to approve your album and send it to the printer in California. With any luck, you’ll have a brand spanking-new photo album delivered to you within 4-7 business days. How much does it cost, you’re all undoubtedly asking. Since price is based on the size of your album, the best way to find out the answer to this question for yourself is to download the SimplePrints app for Android or iOS and get started. Seahorse is a refreshingly simple and elegant solution for organizing and sharing photos with friends and family. The app is based around a concept called “scenes,” which Seahorse defines as “a private space where only those invited can post and comment on photos and videos.” Users can create a “scene” like ‘picnic’ or ‘party,’ and invite the attendees to share their pics from the event. It’s a great way to share memories without exposing them for the whole world to see. If Seahorse’s novel strategy for sharing photos justifies its $1 a month price tag, its feature for viewing older pictures makes the app a bargain. Not only can you view your pictures as a “Timeline,” but you can also view them as part of an interactive map that shows you where you were when you took them. There is also a “Flashback” feature which displays the pictures you took a year ago. If this seems like just the thing for sorting out your untamed gallery of smartphone pics, you can find it for Android, iOS, and iPad. Seahorse’s founders, Daniel Undurraga and Oskar Hjertonsson, have received an undisclosed amount of funding from Nazca Ventures, Socialatom Ventures, and NXTP Labs. If you’ve got an idea for the next great app for shutter-bugs, give us a call. We’ll help you take your idea from the drawing board to the App Store.